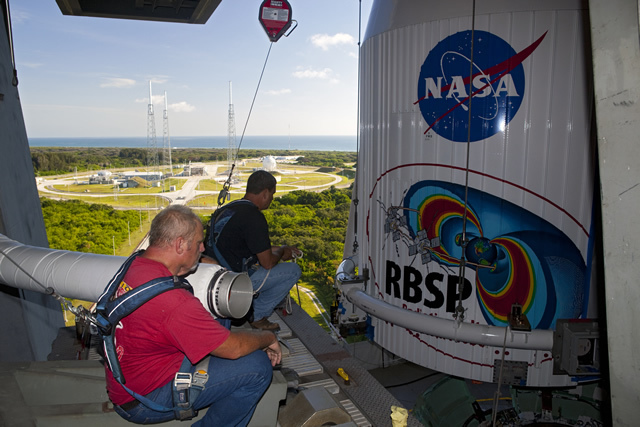 KENNEDY SPACE CENTER -- The launch teams for NASA's Radiation Belt Storm Probes concluded their Launch Readiness Review yesterday afternoon and received the go-ahead to continue preparations for Friday morning's liftoff from Cape Canaveral Air Force station in Florida. After extensive testing of the booster engine actuator system on the RD-180 engines and a thorough data analysis, no problems were found and the rocket has been cleared for launch. The RBSP spacecraft also was cleared for flight during the review and is ready for liftoff. To avoid predicted afternoon thunderstorm activity on Wednesday, the Atlas V rollout has been moved earlier to 8 a.m. EDT. This will allow sufficient time for the RP-1 fuel to be loaded aboard the Atlas first stage before adverse weather arrives. The launch weather forecast calls for a 60 percent chance of acceptable conditions Friday morning. Liftoff is scheduled for 4:07 a.m. EDT on Friday, Aug. 24.